Fibers in a moving air stream collect particles from that air stream that are about the same diameter or smaller than the diameter of the fiber. There are a couple of different micro-environments that can expose glass fiber to moving air streams indoors. The most obvious is the heating, ventilation, and cooling system (HVAC system). Another source is glass fiber insulated walls with perforations. All walls have per- forations at electrical outlets, switches, or along the baseboard of the wall. Normal "breathing" of the wall creates the air movement and over time the glass fibers at those perforations will become coated with these small particles. 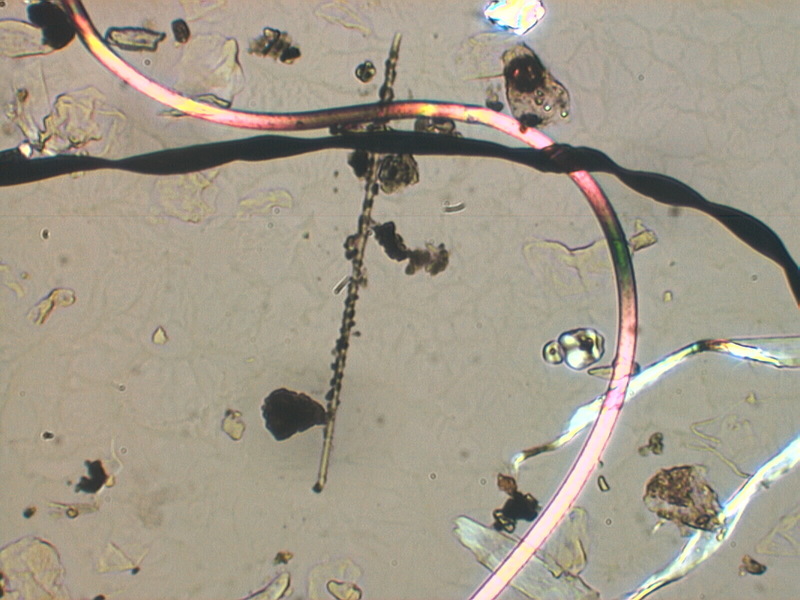 The types of particles on the surface of the fiber can be used to determine if the fiber was exposed to outside air, inside air, filtered air, or recycled air with reasonably high probability using assembalge analysis.